Be the first to share your favorite memory, photo or story of Carleton. This memorial page is dedicated for family, friends and future generations to celebrate the life of their loved one. 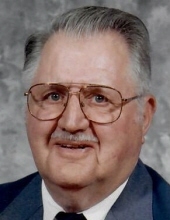 Carleton D. Weiker, 84, of Republic, passed away Saturday evening, January 19, 2019, at St. Vincent Mercy Medical Center in Toledo. Carleton was born November 21, 1934 in Republic, to AI Levi and Nona (Cook) Weiker. He married Phyllis Pontius November 27, 1955 in Tiffin, and she survives in Republic. Other survivors include a daughter, Peg (Phillip) Benner of Tiffin, two sons, Steven (Vi) Weiker of Colfax, Wisconsin. and Jay (Mary) Weiker of Middleton, Wisconsin, nine grandchildren, eight great-grandchildren. He was preceded in death by his parents, two brothers, Bryce and Arlin Weiker, a sister, Catherine Hunker. He was a member of the Republic United Church of Christ, Seneca Lodge #790 in Republic, Cornelia Chapter #93 OES Republic, Zenobia Shrine, Zenobia Roadrunners (drove children to the Shriners hospital), Tiffin Shrine Club, Tiffin Hornets, a 62 year member of the Republic Lions Club, a Melvin Jones Recipient, The Republic Area Investment Club, a US Army veteran, serving during the Korean Conflict, a member of Wade Benfer American Legion Post #404 in Republic, a former school board member for Scipio-Republic and Seneca East School Boards, Seneca Co Farm Bureau, Noba Young Sire Committee, and a board member of Ohio Ag Services, and a 1952 graduate of Scipio-Republic High School. Carleton was a farmer from 1956-1990, and was also a local insurance agent, owning the Weiker insurance Agency, retiring in 2005. Visitation for family and friends will be 4-8 pm. Friday, January 25, 2019, at the Lindsey-Shook Funeral Home, 3085 S. SR. 19 Bloomville. Masonic services will be conducted at 7:45 pm. Friday, January 25, 2019 at the funeral home. Services for Carleton will begin at 10:00 am. Saturday, January 26, 2019, at the Republic United Church of Christ in Republic, with Rev. Darla Metz officiating. Burial will be in St. Jacobs Cemetery on CR.#38 Republic, with military graveside services conducted by Wade Benfer American Legion Post #404. Memorial contributions may be made to Shriners Children’s Hospital of to the American Heart Fund. To send flowers or a remembrance gift to the family of Carleton D. Weiker, please visit our Tribute Store. "Email Address" would like to share the life celebration of Carleton D. Weiker. Click on the "link" to go to share a favorite memory or leave a condolence message for the family.